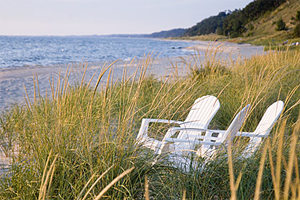 Beautiful Ottawa County is located in the southwestern section of Michigan's lower peninsula. 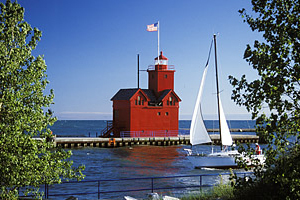 Its western boundary is formed by Lake Michigan and its eastern boundary is approximately 30 miles inland. Ottawa County is 174 miles west of Detroit and 150 miles northeast of Chicago. Ottawa County is composed of 17 townships, six cities and one village, with an area of 565 square miles. Thirty-eight (38%) percent of the County's land mass is farmland. The average growing season is 171 days long. An average of 35 inches of rain and 74 inches of snow fall on Ottawa County each year. The County took its name from the Ottawa Indians who occupied this area in the middle of the 17th century. The Indian word Ottawa means trader. The Ottawa Indians were hunters and fishermen. They grew and harvested wild rice in the swamps along the Grand River. The Ottawa Indians lived in bark huts rather than wigwams and teepees. In 1754 a Frenchman named Charles Langlade came to this area to recruit Indians to fight against Braddock and Washington in the French and Indian War. For his part in the defeat of Braddock, Langlade was given the fur trader rights throughout the entire Grand River Valley.The lucrative fur trade flourished until the middle of the 19th century. One of the fur trade pioneers, Rix Robinson, helped found the city of Grand Haven. When fur trading declined, the lumber industry sprang up. In 1881, 200 million board feet of lumber were shipped from the port of Grand Haven. Toward the end of the 19th century, the timber supply dwindled and the growth of manufacturing began. There are now more than 380 manufacturing facilities in the County, concentrated in furniture, office equipment, and automobile related manufacturing. In 1831, Ottawa County was designated as a territorial County and in 1836 it was attached to Kent County for judicial purposes. Ottawa County was organized by an act of the Michigan legislature on December 29, 1837. At the time, the County included part of what is now Muskegon County. The County Board of 1838 ordered that court was to be held in Grand Haven until further notice. In 1839, the Michigan legislature enabled the appointment by the governor of three county commissioners. The commissioners were directed to impartially select a location for the County seat, considering the County's present and future population. In 1840, the County Commission selected Warren City in Robinson Township (a city on paper only) as the County seat. At that time there were only 208 people and five townships in the County, (Ottawa, Georgetown, Tallmadge, Norton and Muskegon). In 1846, the County population had swelled to 1,200. The County seat was never moved from Grand Haven even though there were votes by the Board of Commissioners in 1856, 1857, 1858 and 1864 to move it to places other than Grand Haven. By 1850, the County population had grown to almost 8,500. Today the County has a population of 260,364 inhabitants and is the 8th most populous county in the state. Ottawa County was originally settled by Dutch immigrants and today forty-five (45%) percent of the population claim Dutch ancestry. Persons of German ancestry are the next largest group, comprising twenty-six (26%) percent of the population. The County also boasts a substantial population of persons of Mexican-American descent. 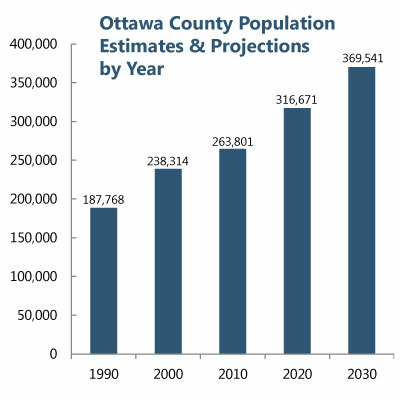 In the last ten years Ottawa County has experienced the third fastest population growth of the 83 counties in Michigan. 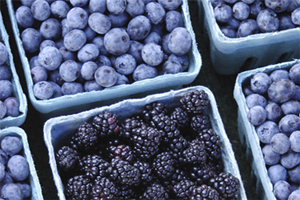 The County leads all other Michigan counties in the production of turkeys, ornamental nursery crops, blueberries and perennials. The County has a state equalized value of over $11 billion. Each year this area welcomes millions of visitors to its vacation playground. In Holland, people from all over the world come to the Tulip Time festival each spring. It is the third largest such festival in the United States. Ottawa County's convenient location and never-too-warm summer climate have made it a mecca for sportsmen and vacationers. Besides Lake Michigan beaches, there are 307 miles of rivers and streams, two state parks, and over 5,000 acres of county parks and open space lands for visitors to enjoy. Ottawa County is truly a pleasant place in which to live and visit.